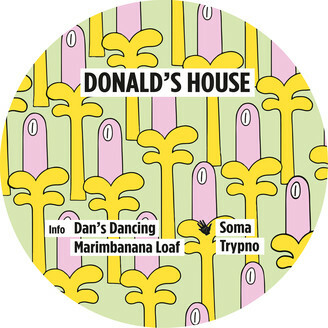 Hailing from Brunswick, Melbourne, James and Peter Isaacs are the brotherly duo Donald’s House. They’ve been making music for around eight years. Without fail, every lunch time when making music, they’ll go to Sesame & Soul on Lygon St and order a cheese pie and zaatar bread. James usually orders a coke zero as well. This EP here is a collection of tracks written over a three year period. There’s a seven year age gap between the two. Pete got James into dance music by taking him to one of his parties that featured Pearson Sound and Mark Pritchard. After that, they started making music together. James is a trained Jazz guitarist, while Pete has been buying and playing records for about 15 years. They’ve released two tracks with Sydney label Ken Oath. One on their debut sampler and one on their ambient tape. They previously lived in London, where they regularly attended CDR. This is where they met the dj Iona, who was the catalyst for the whole release and a mutual friend of theirs and Nick Höppner. Taking influence from Paradise Garage styled disco, early 90s House, Italo and anything with a DMX drum kit, their take on dance dance music is as refreshing as it is familiar. You’ll often hear M1 solos, chords and stabs, juxtaposed against Phil Collins styled stadium drums, and groovy Seinfeld basslines that just beg your body to move.